You might think of tapeworms as awful parasites that find their way into your intestine, grow 15m long and cause horrible gastrointestinal issues. But that's only one step of a larger infectious chain the tapeworm is a part of. The alien life-form doesn't only cause crippling stomach pain; it could also debilitate mental capacities if they find their way to the brain. Warning: this gets pretty gross. 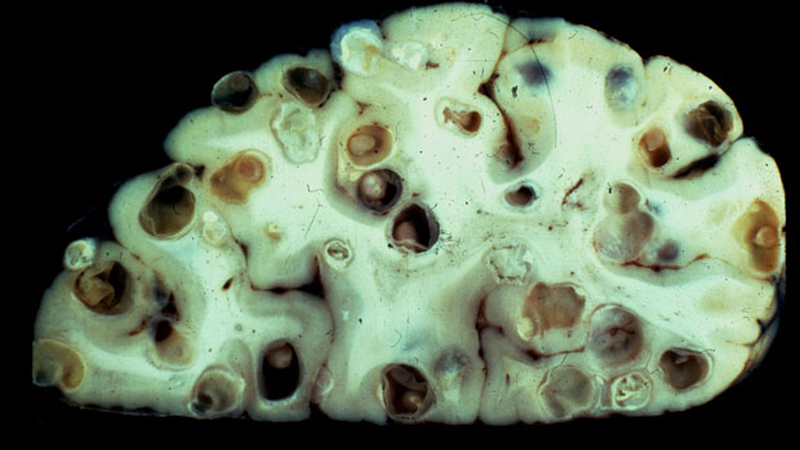 Brain tapeworms, or Neurocysticercosis (NCC), is a parasitic disease of the nervous system. Neuroimages show that they leave infected brains looking like apples that have been left out in the sun to rot. Whitish, grape-like blobs form in vast networks, as if worms have burrowed their way throughout the cranium. How do they get in the brain? Typical tapeworm infection, or Taeniasis, is caused by a transmission between pigs and humans. People typically get these parasites from pork via undercooked meat. When contracted by a person, the worms end up in the intestine, where they can produce thousands of eggs which are intermittently shed through the faeces. Swines might ingest these larvae through food that has been tainted by faeces. If they do, the eggs will hatch and burrow their way into the porcine's bloodstream, where they will lodge themselves into little blood vessels, often in the muscle tissue. If a human eats this meat, the larvae end up in their blood and could travel to the brain where they'll post up inside the ventricles and form cysts, a sign of NCC. Basically, you might want to double-check your next pork chop. Tapeworms can block the flow of brain fluid, which could lead to hydrocephalus, or water on the brain. This can in turn lead to a brain hernia, stroke, stupor, coma, and even death. They could also go undetected for their entire life span. They do die off eventually, but you're far from in the clear when they do. Brain tapeworm death can trigger an immune response from the host's body, which could result in brain swelling and seizures. These issues could persist for years after the parasite has died, because of the presence of calcified cysts. NCC is usually a hallmark of an underdeveloped country that lacks proper sanitation infrastructure. However, it's hard to peg just how common the condition is, because it's often misdiagnosed as another brain disorder. The real proof is in a combination of environmental evidence — usually someone gets NCC if they're in the same household as someone with tapeworms — and an MRI that reveals the hallmark holes. According to a piece in Discover Magazine, Theodore Nash, chief of the Gastrointestinal Parasites Section at the National Institute of Health, estimates that between 1500-2000 people in the US have it. But that number could be much higher. They just don't know. Nash and his colleagues have been studying Latin America specifically, where with the help of blood tests and CT scans, they found that between 11 and 29 million people could have the disease. He says it's an important issue in world health, one that deserves more attention. This is a tricky one. Discover notes that in the mid-1980s, scientists developed praziquantel, a drug that can murder tapeworm larvae in the brain. The problem is that the treatment is too aggressive and can make the swelling even worse. So now doctors like Nash are focusing on prevention by vaccinating pigs and giving medicine to people that have tapeworms in their intestines. In short, probably not. While NCC does affect people in industrialised nations, it's more common in third-world countries. But we shouldn't be entirely ignorant of the condition. Follow common sense by avoiding undercooked meat and eating in places that might seem unsanitary. And obviously, don't eat or handle food without first washing your hands.